What can I say? Rome is our current favourite city. Yes, I know our favourite cities change pretty regularly, but Rome offers so much history, so much good food, what’s not to love. Even with only three days in Rome, it is still a city best explored on foot because, while walking in Rome, you will see that the city is bursting with sights to see on literally every corner. If you are on a budget don’t worry, the public transportation system is good and will deliver you close to the major sites if need be. 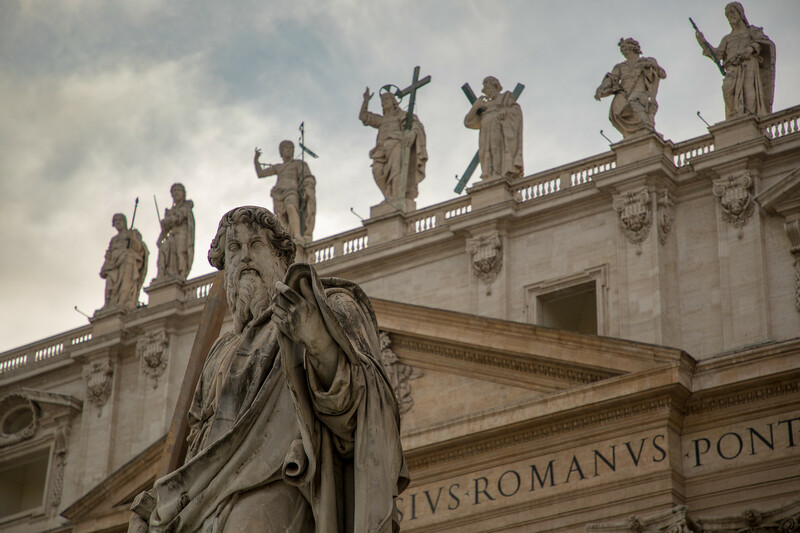 We were lucky enough to spend a week there, but for most visitors, 3 days in Rome seems to be the average, so with so much to see and limited time to see it all, we have put together a three-day Rome itinerary which includes the major highlights and tips we learned during our stay. 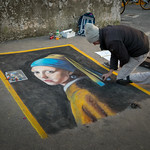 Want to see the Sistine Chapel? The chapel is located inside the Vatican Museums. Most people visiting the museum just want to visit the Sistine Chapel, but there’s a lot more to see here than just the chapel. 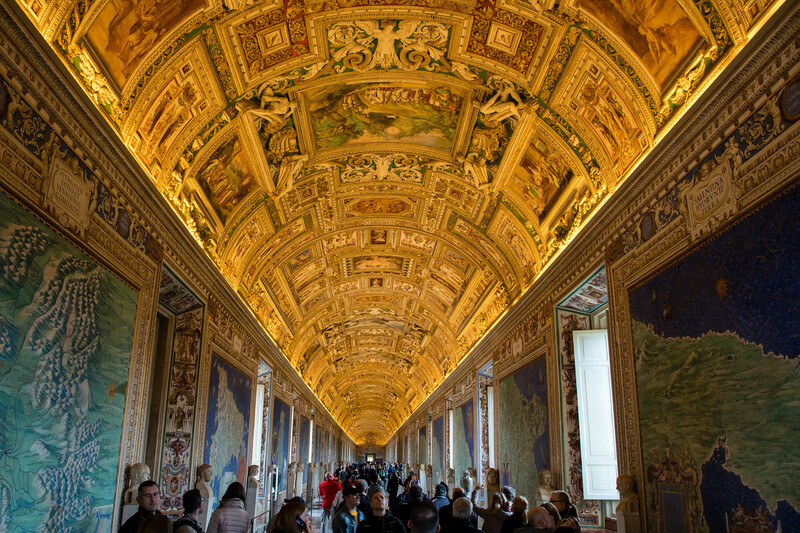 If time is limited, then simply follow the shortcut signs that will take you straight to the Sistine Chapel but if not, then allow at least two to three hours to explore the museums and admire the artwork and sculptures. Although, they say if you spend a minute admiring each painting, it will take you four years to see it all. Yes, the museum is that huge. Our favourite room was the incredible Gallery of the Geographical Maps, absolutely stunning. You are allowed to take photos everywhere in the museum but not in the Sistine Chapel itself, which gets extremely crowded even in the off-season, but there are seats around the edge of the chapel. So you can take a well-deserved rest and simply soak in the artworks of Michaelangelo and listen to the guards shouting ‘Silêncio’ to all the visitors. With only three days in Rome, you don’t want to get weak from hunger so, after visiting the museums, it’s definitely time for a coffee or lunch. Plenty of restaurants nearby. Head to the end of this blog for our list of favourite Roman restaurants. Feeling energised again, walk around to St Peter’s Square (Piazza San Pietro in Italian). The square is one of the largest in the world and is located at the foot of St Peter’s Basilica. The square was built between 1656 and 1667 and can hold more than 300,000 people. On large columns that surround the square are 140 statues of various saints. It’s pretty impressive. It feels just like you’re in the movie set of Angels and Demons. Now it’s time to visit the Basilica itself, and yes, you do have to join that long queue but don’t worry it moves pretty quickly and it’s for the security check. There is no charge to enter the Basilica, and it’s most definitely worth queuing for, it’s stunning inside. Interesting fact: St Peter’s Basilica is not the largest church in the world, contrary to what some of the touts will tell you. That honour goes to the Basilica of Our Lady of Peace of Yamoussoukro on the Ivory Coast. Still, have some energy left? 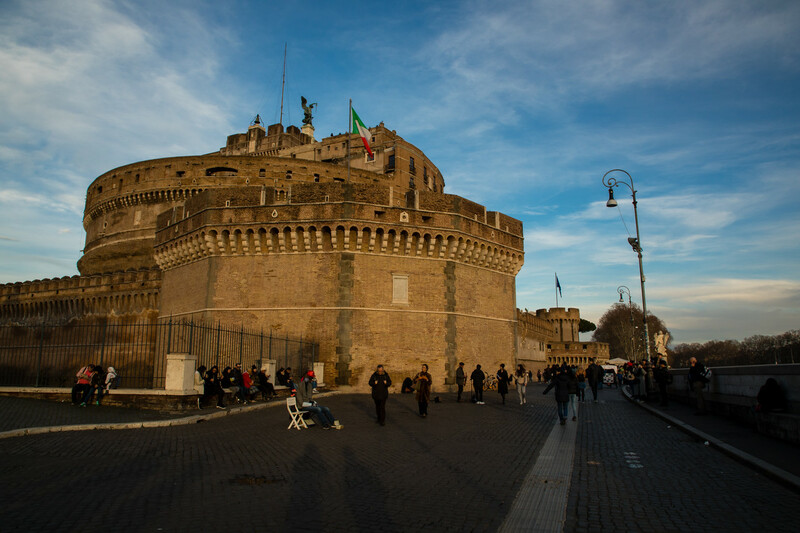 Head down towards the river and visit the Castle Sant’Angelo. You can’t miss it, just follow the music, there were some incredible street musicians just in front. The best part of the castle is the view from the top, head there for sunset. There’s also a nice bar in the castle walls offering great views too. Ok, that’s definitely enough for one day, time to relax now and enjoy some Roman food. Nearest Metro: Cipro-Musei Vaticani, then just follow the crowds. Or do what we did and walk. Admittedly our guest house was just ten minutes away. Open Monday through Saturday 9 AM to 6 PM. Last entry 4 PM. Last Sunday of the month 9 AM to 2 PM. Last entry 12.30 PM. If you plan to spend a few hours exploring the museum, bring water and snacks. Ignore the touts outside that say you can’t enter without booking a tour, or that the museum/ Basilica is closed unless you go with them. If you are going in the summer, consider pre-booking tickets online to skip the queue. No three day trip to Rome would be complete without a visit to the Colosseum. It was built almost 2,000 years ago to host violent gladiator games. It has a fascinating, yet gory, history. Thousands of men and wild animals fought for their lives here, providing entertainment for the locals. It’s really worth getting a guide here or an audio-guide to learn and understand more about the history of the place. Guided tours are available inside the Colosseum for just €5 per person. Tours last about 45minutes to an hour though you should allow at least one to two hours here, just to soak up the history. For an extra charge (€9 as at January 2018), it is possible to visit the hypogeum. This is the underground complex where the animals and sets were stored before being winched up on stage. Although you do get a great view of this from the first floor of the arena. 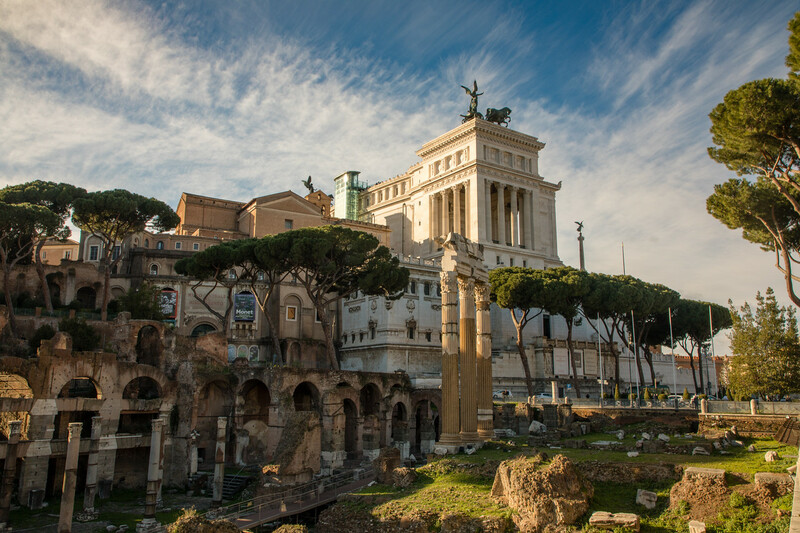 From here, grab a snack or enjoy a break at one of the nearby cafes before heading into the Roman Forum. The Roman Forum was once the marketplace for Rome, and later on, it was where gladiatorial matches and triumphal processions took place. Today, it is a mass of ruins, but you can easily still identify the temples, the main squares and streets. It’s an interesting place to explore, but not particularly well signposted. A good guidebook or an audio-guide would be handy. A short climb takes you up Palatine Hill, the most famous of the seven hills in Rome. From here, you have great views of the Roman Forum, the Colosseum and the city. In Ancient Rome, this was considered the best neighbourhood of the city to live in. Clean air and away from the peasants. It is also believed to be where Romulus and Remus were found in a cave by a she-wolf. 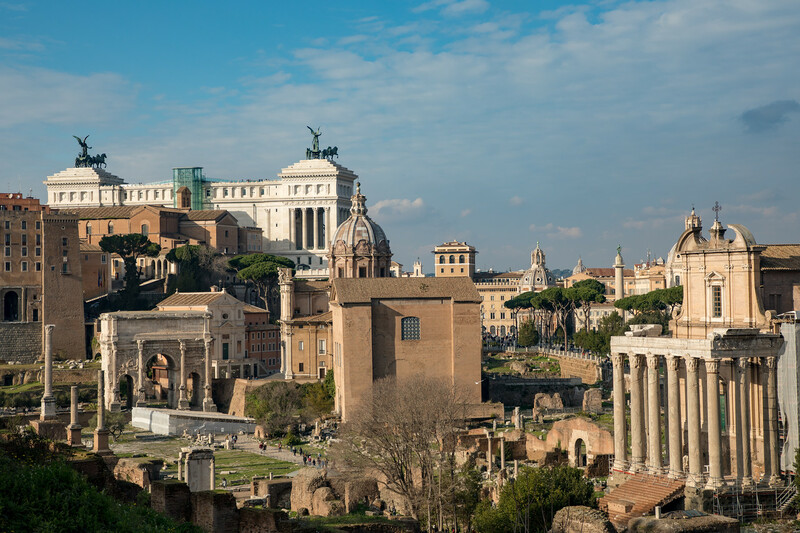 We didn’t expect to spend more than an hour exploring the Roman Forum and Palatine Hill but the site is huge and the more you explore, the more you find to explore, so you really need a good half day to see it all. At the very top of the hill, there is a small self-service snack bar, if like us, you didn’t heed your own advice and bring water. Toilets are available in the museum. If you feel like this is too many Roman ruins for one day, your entrance ticket does allow you to visit one site and the other on two consecutive days. Now it’s time to relax and enjoy some good Roman food. How to get to the Colosseum/ Roman Forum and Palatine Hill. Best Way is on foot, then you get to see a whole lot more of Rome. Bus: 40, 46, 62, 63, 64, 70, 87, 119, 271, 280. 08.30 AM until one hour before sunset. Closed Christmas Day and New Years Day. Adults €12 also includes admission to the Royal Forum and Palatine Hill. Ticket valid for two consecutive days. Only one entry permitted into either area. Avoid the touts. They will offer to be your guide and help you skip the line. They will really overcharge you. 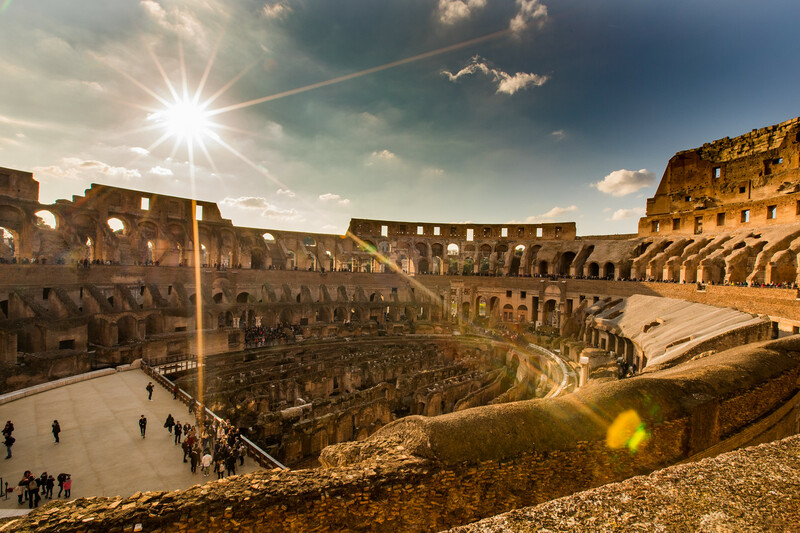 We suggest you buy your ticket at the nearby Roman Forum or Palatine Hill as the queue is considerably smaller and allows you to enter the Colosseum. If you want a guide, you can join one of the tours offered at the Colosseum for €5 per person or rent an audio guide. Also, avoid the men dressed as Gladiators, fun for photos, but there are stories of them demanding €20 to have your photo taken with them. Stop and listen to the street musicians. This is our favourite way to explore any city. It really is an incredible city to explore on foot. Our walk took us through many of the city’s beautiful piazzas, always a great place to enjoy coffee and people watch. 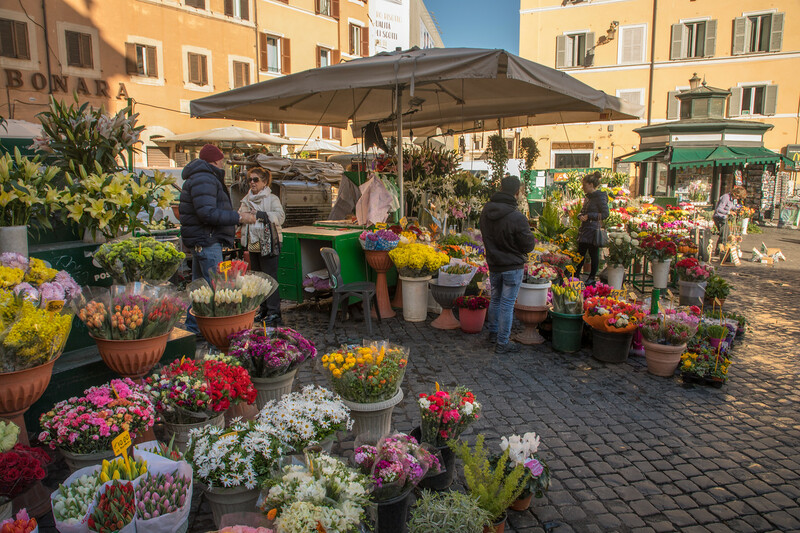 Explore the local fresh food markets, offering not only fruits but fresh pasta, chillies and flowers. Enjoy a delicious gelato by the Spanish Steps. Throw a coin in the Trevi Fountain. 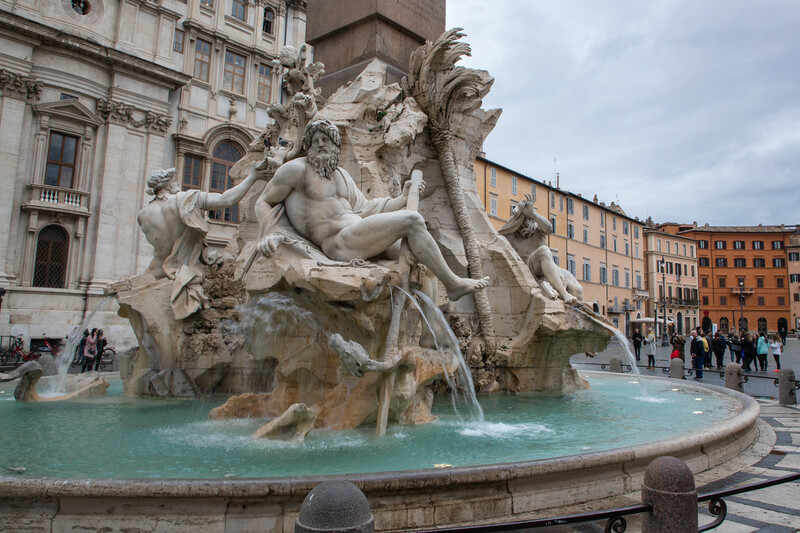 (There are two superstitious legends about the Trevi Fountain. 1) If you throw a coin with your right hand backwards over your left shoulder, you will definitely return to Rome or 2) throw three coins into the fountain. The first coin guarantees your return, the second for a new romance and the third will lead to marriage.) Yikes, glad I only threw one!! The money is collected from the fountain every night and donated to charity. Admire the dome in the Pantheon. Pop into local churches, they are beautiful. Marvel at the old buildings that have stood for centuries. And, of course, eat lots of pasta and pizza. Here’s a list of some of our favourite restaurants we discovered while in Rome. Our absolute favourite was the Taverna Lucifero on Via del Pellegrino. So good, we broke our cardinal rule on our travels and visited twice. And next time, we are in Rome, it will be our first port of call. Yes, it’s that good. Think truffles, fondues, pasta. Good idea to make a reservation, and you can book on Facebook messenger. Sorpasso, close to the Vatican. Great for big healthy salads, and plates of pasta. Veloavevodetto, also close to the Vatican. Traditional Italian restaurant. Get here early or make reservations. Coromandel, good coffee and breakfast stop. Best Eggs Benedict in Rome. Popular on Sunday mornings. We were also recommended to visit Frashetta for pizza. Unfortunately, it was closed while it was there, but the reviews for this place were good. For good sandwiches, slices of pizza, try some of the many delicatessens. Carry small change, as waiters tend to think you have just given them a large tip and don’t return your change. 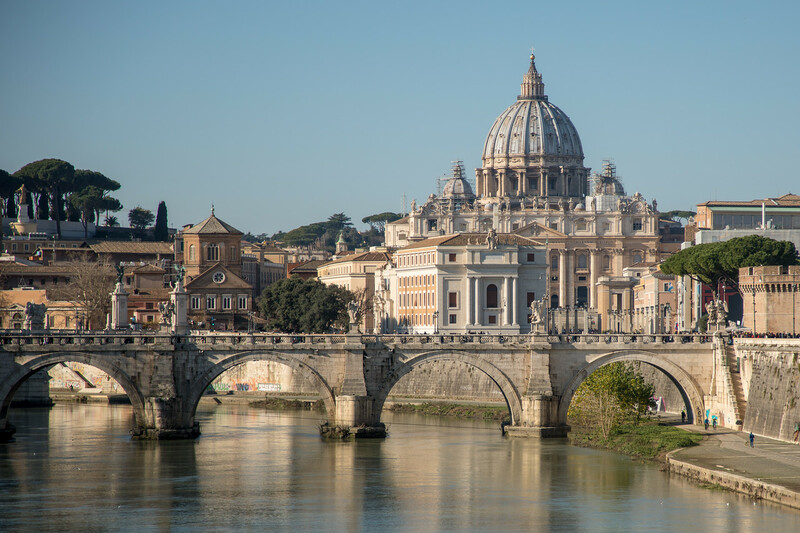 We hope you enjoyed our guide to 3 Days in Rome. If there’s something we have missed or if you have any questions, we will be delighted to hear from you. Ah Rome – one of my fave cities. This is the perfect guide, thank you for sharing. It makes me want to go back ASAP!!! Great guide Jonathan. We visited Rome October 2017. If I may add: Buy your tickets in advance and skip the lines. Also for the vatican, tour the museum first and then when exiting the Sistine chapel exit to the RIGHT. The sign will say exit is for tour groups only, but lots of people go this route and nobody is there to check. This route takes you directly to St. Peters and you don’t have to go back through security. This step alone can save you hours in the queue. One restaurant to avoid near the Vatican is Bar Moretto…900+ bad reviews on TripAdvisor…one of them is mine. Thanks for the article. My daughter and I went to Rome in 1993. I haven’t been back since, but she’s going with her family for a short visit in a few months. I’ll send her a link to your article. Thanks Rita! Rome is another in our long growing list of favorite cities.